The best solar security lights protect your home from most burglars and break ins. These high tech devices use solar energy during the day to charge their internal battery. Once daylight is no longer present they shine bright whenever motion is detected. This bright light typically deters criminals from entering your home as they can be easily spotted. Since these devices can be so beneficial we had to write a review on the top solar security lights on the market. Down below we have tested and reviewed each. We recommend looking at all of them until you find the one best suited for your needs. First on the review is the Sunforce 82080 Solar Security Light. In our opinion this is one of the best security lights you can buy. This is because the Sunforce is one of the most powerful solar lights out on the market. Along with this it’s still energy-efficient and very cheap. On front of the Sunforce is 80 LED lights. These white LEDs shine bright when motion is detected in front of the sensor. The sensitivity on this sensor can also be changed to higher or lower. The highest settings are 30 feet away and a range of 180 degrees. To power this bright security light a 1W, 6V solar panel. This panel charges the AA 5-pack of batteries during the day. At night the Sunforce then uses this battery pack to power the lights. Since the Sunforce uses solar energy there is no long wiring needed. All you do is simply set up the panel, and the light. This process is extremely simply and takes only minutes. This easy set-up is important to most as majority of people don’t know how to set up wiring or even have the time to. All the materials used in the Sunforce 82080 are hight quality. The LEDs are built-in ABS plastic and aluminum housing. The amorphous panel is built with high efficient cells. These cells allow you panel to charge the internal batteries as fast as possible. To add on to this all of the equipment is weatherproof so you don’t have to worry about water damage or anything like that. Overall the Sunforce 82080 is one of the best solar security lights out there. The light is extremely powerful, so any intruder to walks by will be seen. The quality materials and easy setup make it worth while investment. So if you’re looking for a powerful security light then we recommend checking the Sunforce out. Super bright with 80 LEDs. Uses quality materials that can last decades. Second on the review is the MAXSA Innovations 40218 Solar Security Light. This solar light only has much less LEDs then the above light. In fact it only has 4 LEDs. With that being said this solar security light has two separate heads so that you can cover as much space with light as possible. For this reason it landed second. As we mentioned above the MAXSA has two separate light heads. Within both of these heads are 2 LEDs to yield 4 in total. Even though there are much less LEDs on this light, it’s still very effective at lighting a given area. The dual heads also help with this brightness as it can cover more space. The MAXSA also uses an amorphous solar panel. This type of panel allows you to charge the 3 AA batteries on sunny and cloudy days. Ensuring that you always have power no matter what type of day it is. As with all of the lights on this review the MAXSA can be installed within minutes. All you have to do is install the light and then the solar panel. You don’t have to hassle with long cords and no electrician is needed. This is a big plus for many as they want something simple and easy to use. This particular light is made of durable, heavy-duty plastic. This heavy-duty plastic can withstand extreme heat and strong impacts. The light is also weather-proof so it can handle any outdoor weather conditions. Overall the MAXSA is a wonderful light. Even though it has less LEDs than most of the lights on this review, it’s still very bright and will definitely get the job done. We recommend this light if you want a dual head solar light that is extremely durable. Dual LED heads for full coverage. Third on the review is the InaRock Solar Security Light. This particular solar light has 44 LEDs and is designed much differently than the above security lights. The InaRock is a one piece light so installation is even quicker than the above models. For this easy of convenience it has landed third on the review. As we mentioned above the design of this is much different from the above models. It’s simply a one piece solar light. On front of the light is 44 LEDs. These LEDs allow the light to shine very bright even though its relatively small. On top of the LEDs is a thin solar panel. This panel is extremely efficient to get the best charging times possible. The energy that this panel captures then going to the 2,200 mAh internal battery. This battery can then power the light for ten hours without dying. The design of the InaRock is very slim and small. Since this is so the solar security light is weatherproof and very durable. Giving you a good state of mind since it will be outside all the time. The sensor on this light is very also effective. In fact it can sense people 30 feet away. The the end the InaRock is an amazing solar security lights. Its small and slim design makes it extremely durable and easy to install. The light isn’t as intrusive as the above lights and is perfect for those who want a more hidden security light. So if you’re looking for a slim yet powerful solar security light then the InaRock is best suited for you. Fourth on the review is the LAMPAT Solar Security Light. LAMPAT is essentially a smaller version of the above InaRock. It’s a small one piece solar security light that is very easy to install. On the front of the solar light is multiple LED lights. These LEDs shine bright when movement is detected in from of them. To power this light is a small solar panel. This panel is extremely efficient as it has a conversion rate of 17%. This high conversion rate allows the internal battery to be charged in a short amount of time. The LAMPAT has a built-in PIR motion sensor. This sensor has a range of 15 ft. If no further movement is detected then the light automatically powers off after 10 seconds. The solar security light also has light sensor that automatically detects when it is becoming too light outside. Once the outdoor light reaches a certain level, the light will enter day mode and start charging. Since the LAMPAT is a once piece solar light it’s very easy to install. It only takes a few minutes and no wiring is required. The light is also very durable so you don’t have to worry about the wear and tear of the outdoors. Overall the LAMPAT Solar Security Light is a great solar light. It’s very small and not intrusive in any sort. This cosmetically appealing aspect of the solar light makes it a top contender for many. One thing we do want to mention is that the light from the LAMPAT is not as bright as the above models. So if you want something more powerful than the above models are best for you. If you rather want a small yet moderate solar light then this is perfect for you. Produces less light then the above models. Last on the review is the Frostfire Solar Security Light. This particular light is a one piece model, but is designed different from the above solar lights. The Frostfire doesn’t perform as great as the above models, but has one of the best cosmetic designs. For this reason it landed last on the review. On the bottom of the Frostfire is 16 LED lights. These moderately powerful lights shine bright to the ground. Since they mainly shine down they are perfect for lighting walkways or for anything near the security light. On top of the Frostfire is a small solar panel that has a conversion rate of 17%. This panel charges all day to power its 800 mAh internal battery. This battery then powers the light at night. The built-in motion sensor activated the light when entering its 3 meter activation zone. The Frostfire uses no wires and is only one piece. All you have to do is screw the light into your preferred surface and its ready to go. This process takes minutes and requires less effort than most other security lights. Overall the Frostfire is a great solar security light. We think its best attribute is its cosmetic looks and not it’s power. With that being said it gets the job done and lights up whenever something moves near by. Super bright for its small size. The act of planning and buying security equipment for your home can become daunting at times. This is because there are simply so many varieties of security products out there, all offering their own positives. One of the most important of these is security lights. These simple yet essential lights can be the difference between an intruder coming inside your home or not. Since this is so, its important to find the best ones suited for you. In our opinion out of all security lights, solar lights are the best. This is because they can literally be placed in most outdoor places without the hassle of dealing with long cords. This of course is essential to those who have cabins or structures with no built-in electricity. The solar panels run off the energy of the sun and doesn’t need to be plugged in. 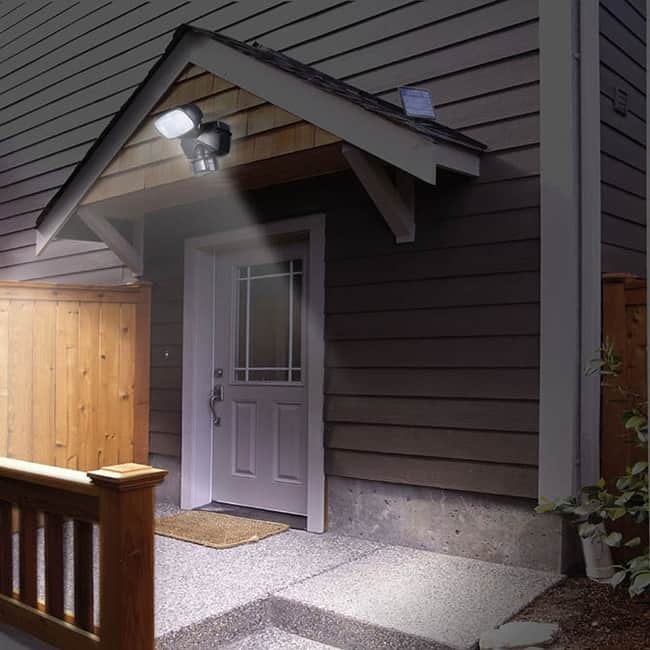 These solar security lights are not only hassle free, but they save you money as well. They do this by saving you money from not having to hire an electrician. Placing regular security lights sometimes require a professional and can add up in cost. You simply install these solar lights in a few minutes and you’re done. These solar security lights also save you money by not using any energy off the grid. Instead the light uses free energy from the sun. The higher models of security lights have multiple different settings. You can change the light duration, sensor sensitivity, and the brightness of the light. With these many options you can find the best settings to secure your particular house. All of the below solar lights are also very durable. All are built with weather proof materials and can handle the wear and tear of the outdoors.